* Fine print: we reserve the right to limit quantities sold to an individual customer. The price match guarantee does not apply to advertising that states “limited quantities,” “clearance,” “close-outs,” “bankruptcies” or special events (e.g. Boxing Day). We do not match typographical errors in advertisements, nor do we match service fees or rental/outfitting rates. Prices do not include applicable taxes. 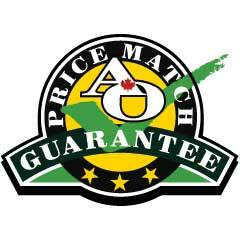 We reserve the right to modify the terms of our price match guarantee from time to time. Will you match prices from outside of Canada? We only match prices with stores that have physical “bricks and mortar” locations in Ontario. Often products sold in other countries, or even other provinces, have different warranties or policies associated with them. In addition, currency exchange rates fluctuate daily and shipping costs incurred with sourcing products from other countries affects prices significantly. If I find a lower price at another store in Ontario how do I go about getting a price match? Just show us the current lower price (published store ad, store quote, etc.) from any in-stock item that is the same make, model and version as the item at Algonquin Outfitters and we’ll match the price. When comparing prices shown on-line, please note that retailers with stores across Canada AND an on-line store do not carry all items at all locations. Please verify that the item is available and in stock at a location in Ontario. If I purchase an item at your store and later find it at a lower price can I get the difference back? Yes you can, we offer a 14 day guarantee on any purchase. If you find a lower price in Ontario, with in 14 days of your purchase, just contact us at 705-787-0262, or come back to the store with your receipt, and we will be happy to match the lower price. Accepted file types: jpg, jpeg, gif, png, pdf, doc, txt. Before submitting your question, have you tried searching here? You may also like to check out our FAQ. Before submitting your question, have you tried searching our FAQ? Yes, I have already tried searching the above section(s).